Headquartered in Saratoga, Wyoming, the ranch is privately owned and operated. Only authorized access is permitted. Learn more about group accommodations at Riverbend Lodge. SARATOGA, Wyo., Sept. 15, 2014 – As part of its program to responsibly manage and graze federal and private land, The Overland Trail Cattle Company LLC recently removed nearly 6 more miles of legacy woven-wire sheep fence and replaced it with new wildlife-friendly fence on the Overland Trail Ranch. The fence was replaced in important pronghorn habitat. Pronghorn do not typically jump fences like elk or deer. The new fencing is easier for pronghorn to crawl under, which supports their migration and foraging needs while also adequately enclosing cattle. Wildlife-friendly fence is designed with single wire strands, and the lowest strand consists of smooth, rather than barbed, wire that also is placed at a higher-than-usual level. 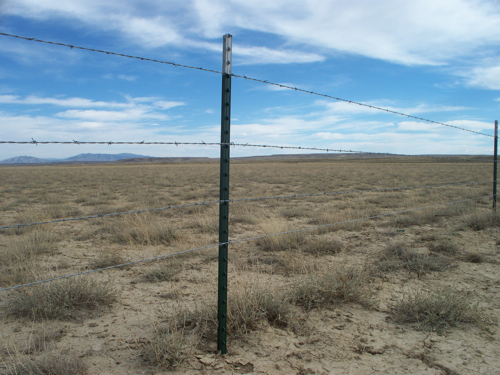 This type of fence also reduces collision risks for greater sage-grouse and other avian species. 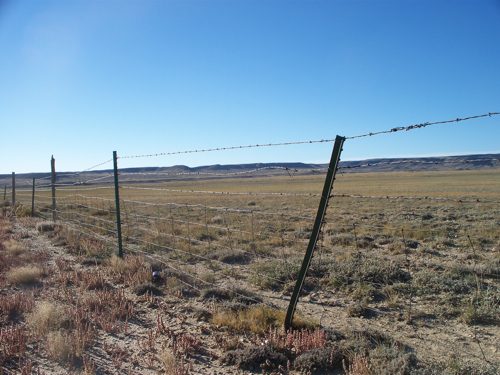 Completed in August, the fence replacement project was supported in part by the Wyoming Game and Fish Department and the U.S. Bureau of Land Management. It is one of many fence removal and modification projects that TOTCO has implemented across the ranch over the years to support wildlife conservation, along with multiple other conservation measures. The Overland Trail Ranch is located in Wyoming’s checkerboard, where private land and federal land is interspersed. BLM recognized TOTCO earlier this year for ensuring that all of TOTCO’s cattle grazing allotments meet all six BLM Rangeland Health Standards. prior to the ranch's ownership by The Overland Trail Cattle Company. and the bottom wire is smooth.